Regency Stone specializes in providing high quality natural and engineered stone bench tops. 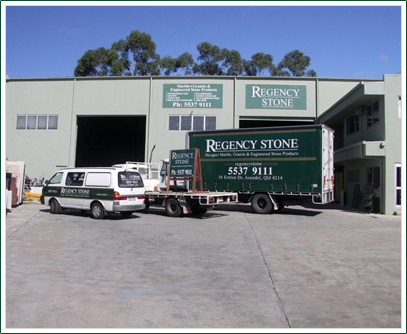 Regency Stone was established in 1997 based in Arundel, Gold Coast, Queensland, focusing on the residential and commercial sectors of the building industry to supply and install natural and engineered stone bench tops. To be successful in this industry, material quality, product finish, process lead times and quality of workmanship – above and beyond the current industry standards – are our objectives. Amongst a competitive industry, we believe customers choose us based largely on the high quality products and reliable services that we provide and pride ourselves on. In order to strengthen our leadership role in the industry we aim to meet and exceed customer expectations 100% of the time. We endeavour to do this by working with customers to continually improve standards of quality, striving to do so at a competitive price. With over 18 years of experience we continue to produce high quality designed applications including but not limited to kitchens, bathrooms, bar tops, spa surrounds, stairs and fireplaces. Since founding, Regency stone has introduced new technology and services in marble and granite bench tops. A fully automated computer numerical control machine (CNC) is used for edge detailing to the highest quality in the industry, producing unique and exclusive bench top edge profiles. Artistic designs and shapes to bench tops are limited only by your imagination. The CNC machine offers styled drainer grooves to produce many designs or even ‘create your own’ to suit your needs. For the finest marble, granite and engineered stone products along with excellent service, contact one of our friendly staff today on 07 55379111. To experience everything we have to offer including our qualified interior designer to assist with colour selections, we invite you to visit our showroom at 36 Ereton Drive Arundel 4212.